Let me start by saying, no, those are not potatoes. However, they are extremely deceiving in looks and mouth feel! Matthew and I just recently started experimenting with them and we fell in love instantly. We didn't care much about having something to replace the potatoes because at this point cauliflower really satisfies us. But, we were looking for another low carb vegetable to mix into our cooking! 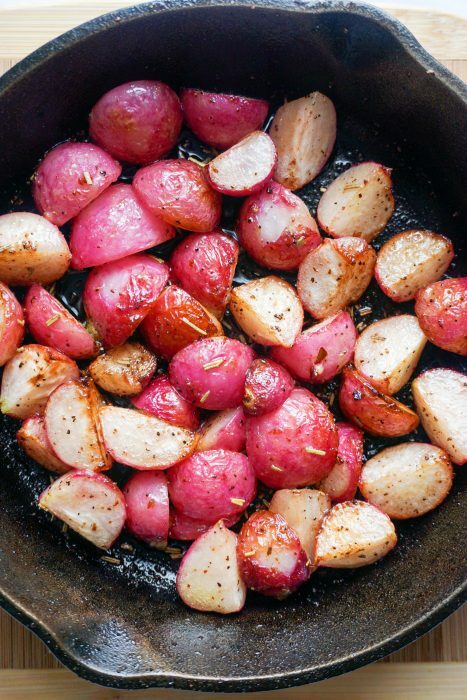 Radishes are very low in carb for the amount per serving and roast up great in a skillet or in the oven, perfect for our Low Carb Breakfast Bowl! This recipe is really simple and fun because you get to layer a bunch of different foods! We kept it simple with a layer of radishes, a layer of sausage, a layer cheddar cheese and then one over easy egg right on top! This is a great breakfast, lunch or dinner idea because you can easily change up the ingredients. Another awesome idea would be a bottom layer of roasted broccoli, topped with crumbled bacon and blue cheese, and an over easy fried egg. 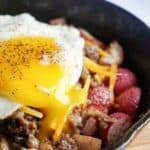 I could list off breakfast bowl recipes all damn day! Matthew's favorite foods are breakfast foods. He could eat breakfast for every meal, probably for the rest of his life. Me, not so much! However, this recipe takes breakfast to another level. I love to eat mass amounts of food and that is what this recipe allows! How is it even possible that this much hearty and deliciously satisfying food is only 4 net carbs?! The secret is in the radishes. If you're not a fan of radishes, but still love breakfast bowl recipes you should give our Keto Oatmeal or Mexican Breakfast Bowl a try! 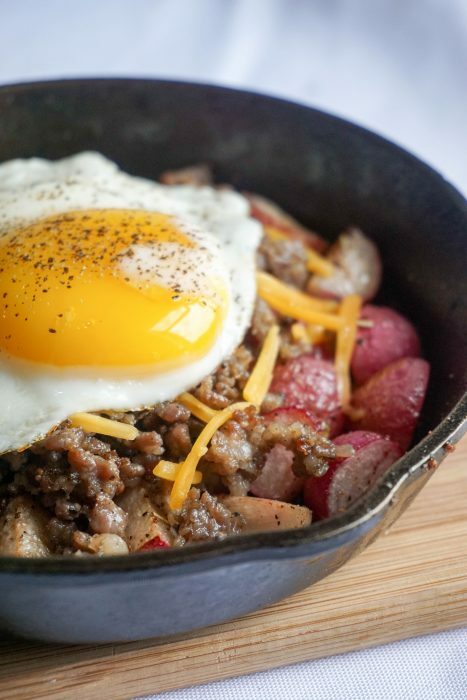 We love using cast iron skillets whenever possible, especially for a recipe like this one. 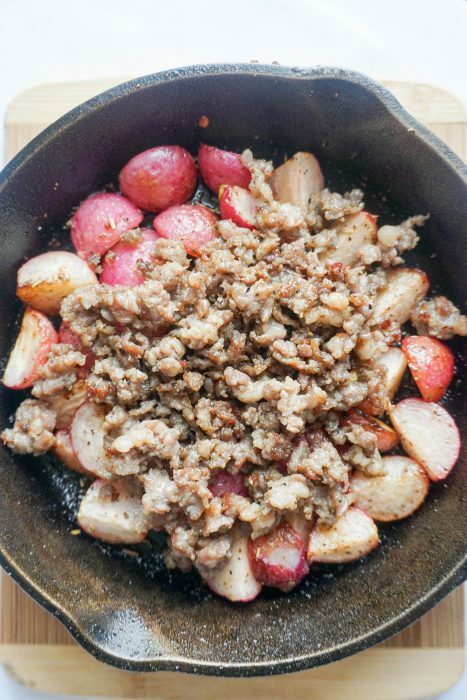 For this recipe we use our 6-Inch Cast Iron Skillet that we are basically obsessed with. Not only is it great for single serve meals, but you can cook everything in it and stick it right in the oven if you need to, thus making for less dishes! It's a win-win for us so we always highly recommend having one at home. 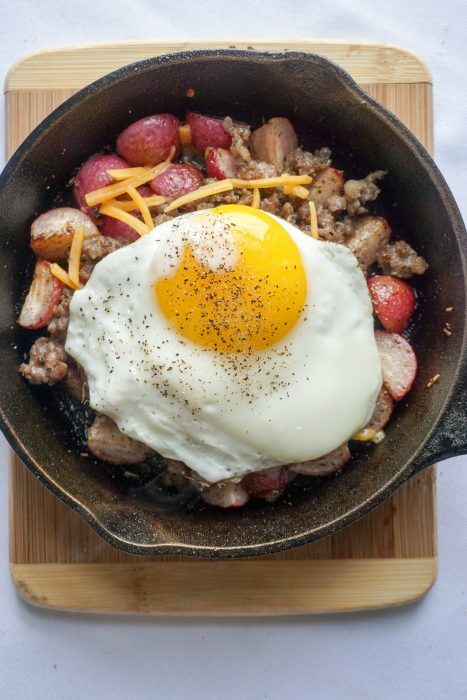 Maintaining your cast iron skillet is a whole other thing. Check out this page to get the rundown on how to maintain yours so you can make your very own Low Carb Breakfast Bowl! 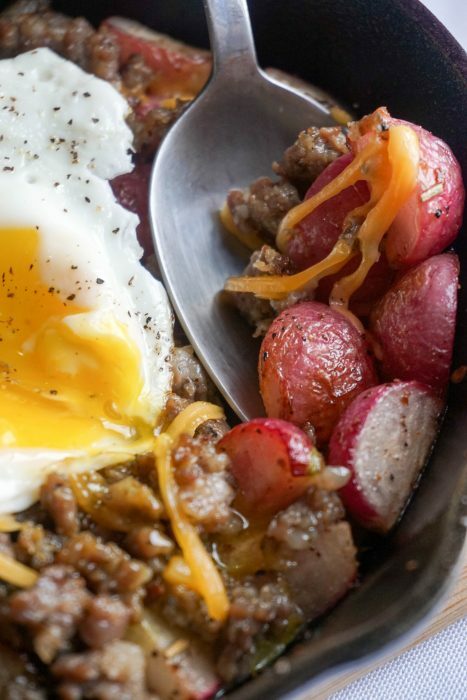 Recipe can be quickly added to MyFitnessPal - Search "KetoConnect - Low Carb Breakfast Bowl"
Cook sausage in a medium high heat until fully cooked through. Remove sausage from pan and set aside leaving grease in the pan. Cup up radishes into bite sized pieces and add to the pan. Season with salt and pepper. Cook until radishes become tender to bite or easily pierced with a fork. It should take 8-12 minutes. In the meantime fry up an egg to your preference and set aside. We like ours over easy so the yolk can spill into all the layers! Once radishes are fully cooked layer with sausage, cheese and egg. The warm layers should melt the cheese.